NIA CHARLESTOWN NEVIS (December 04, 2018) — The Republic of China (Taiwan) continues to make good on its promise to assist the Nevis Island Administration (NIA) in its quest to arrest and control chronic kidney disease on the island. 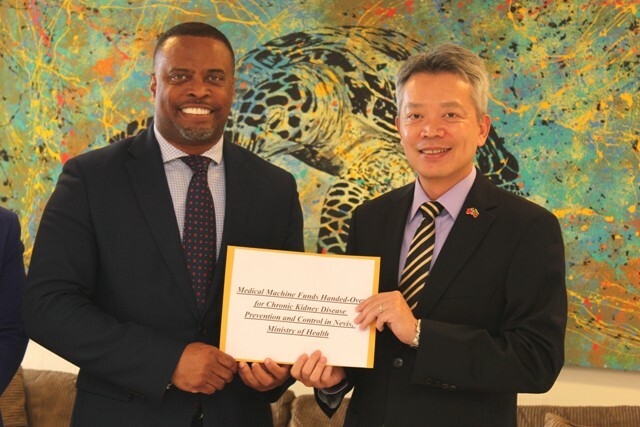 On November 04, 2018, His Excellency Tom Lee, Resident Ambassador to St. Kitts and Nevis handed over a US$167,000 cheque, to Hon. Mark Brantley, Premier of Nevis and Minister of Health, at his Pinney’s Estate office. “We are here is to present a cheque in the amount of US$167,000 as a part of the funding for the project of Control and Prevention of Chronic Kidney Disease (CKD). “The amount is meant to procure hemodialysis machines and the water systems etc. and I really believe in the near future all the CKD patients they don’t have to travel to St. Kitts anymore, they can enjoy the service in Nevis,” he said. 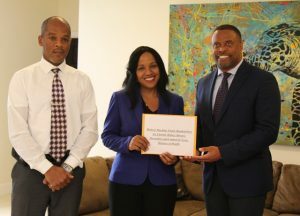 The Ambassador noted that the embassy continues to work tirelessly to ensure that more people from St. Kitts and Nevis benefit from cooperation projects between his country and the Federation. 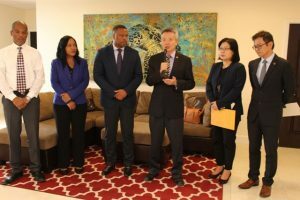 Mr. Brantley thanked the government of the Republic of China (Taiwan) for its continued attention to the partnership forged with St. Kitts and Nevis 35 years ago. He underscored the significance of the health initiative dealing with the issue of renal failure, an illness which is of major concern locally and regionally. “Non-communicable diseases (NCDs) continue to be a major threat to our healthcare system. A major threat not only in terms of morbidity and the tragedy that it causes for so many families, the cost that it causes for so many families but also of course the fact that in our statistical analysis of the region suggest that it is a regional problem and that 8 out of every 10 deaths are attributable to NCDs. “That for us is really a crisis and it therefore means that we have to do more. It consumes a tremendous part of our budget each year to treat NCDs and so we need to do more… We think that the programme…is timely and critical, and I think that it speaks to the level to which the government and people of Taiwan has always been interested in not just buildings or roads, which are important but developing the human capacity, and so for us that is the type of development that is long-lasting and so we want to thank you Excellency,” he said. It is designed to strengthen the capacity for prevention and control of chronic kidney disease in the Federation, through early detection and case management. It is expected to result in a reduction of risks and costs associated with the disease. The project has three areas of focus: to establish a database for chronic disease patients and its high-risk group; to strengthen the function of the Nephrology Unit at the Alexandra Hospital and the capability of the health personnel addressing chronic kidney disease; and to raise public awareness of chronic disease and to introduce the necessary health education related to the prevention and control of chronic kidney diseases in communities and schools. Also present at the ceremony were Ms. Cynthia Hung, First Secretary at the Embassy of the Republic of China (Taiwan); Mr. Feng-Ta Tsai of the Taiwan International Cooperation and Development Fund (ICDF); Mrs. Nicole Slack-Liburd, Permanent Secretary in the Ministry of Health; and Mr. Gary Pemberton, Administrator at the Alexandra Hospital.